Looking for low boy transportation in Brooklyn? At Jets Towing we provide exceptional lowboy services in New York. Our fleet of dependable trucks are fully equipped to handle any type of heavy duty load, whether equipment or machinery, that needs to be mounted on a lowboy for transportation. Heavy shipments are extremely technical and require expert low boy capability. 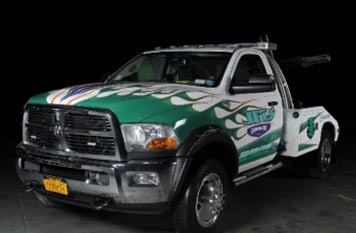 In New York, Jets Towing has helped numerous customers to transport heavy equipment such as generators, modular buildings, tanks, fire engines, etc. No project is too big or small for us. We understand what’s at stake while transporting heavy and costly equipment and machinery, and we take great pains to ensure that the cargo that you have entrusted to us is safely and securely transported to its destination. We offer specialized low boy transport services that accommodate a large variety of heavy equipment. Our lowboy carriers can pick and deliver all the machinery and equipment across New York City. Using hi-tech systems, our experienced truckers and control room operators maintain constant monitoring of the freight being mounted, hauled on the Lowboy until the transportation is successfully executed. With a firm commitment to achieving excellence we have unceasingly striven to enhance the efficiency of our operations, so much so, that we are the top choice of customers for low boy truck transport in NYC. If you would like your cargo to be transported by experienced professionals equipped with top of the line vehicles, look no further than Jets Towing!